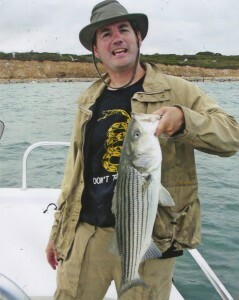 A vertical lure presentation is obvious when fishing from a boat, but it is often overlooked by the shore-bound fisherman. We cast out and retrieve at one depth, whether that be near the surface or along the bottom or at one given depth inbetween. Most lures are designed to be most effective on the retrieve. Spoons, on the other hand, are equally effective on the drop as on the retrieve. By using a start and stop retrieve you can cover the entire water column. 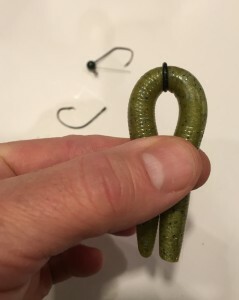 This is a technique that works great when walking the banks of steep sided lakes and ponds for suspended trout. My spoon of choice for this technique is the Len Thompson. This rainbow’s day was interupted by a Len No. 7.. It will take a few casts to find the proper pattern of starts and stops. Begin with a cast to deep water. Take up most of the slack line. Count at a steady pace and watch the line. when the lure hits bottom take note and begin your retrieve. I generally reel this first cast straight in. It is likely that your spoon picked up some weed or algae. The next cast is when we start fishing. Repeat the process, but start your retrieve one or two counts less than it took to reach bottom on the first cast. For example; if it hit bottom at 10 on the previous cast, start reeling at 8 or 9 this time. Now, this cast I will again reel straight in, but with confidence that it is clean. 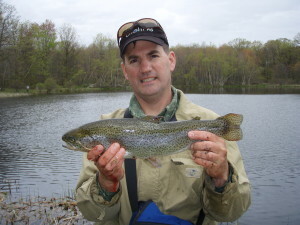 Your lure will cut a diagonal path from the lake bottom to surface at the shoreline, and hopefully encounter trout along the way. 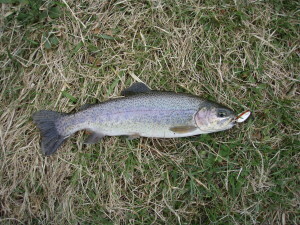 This nice stocked rainbow was one of many on a day when “the drop” was key. Next, try some mid retrieve drops. About halfway in, let it drop while counting. Note when you hit bottom. Subtract one or two and use this as your mid-retrieve drop count. Now, your retrieve will start with a vertical flutter toward the bottom, swim diagonally up toward the surface, flutter downward again, and finally swim to the surface again. With this sytem you can cover the entire water column with a zig zag pattern. 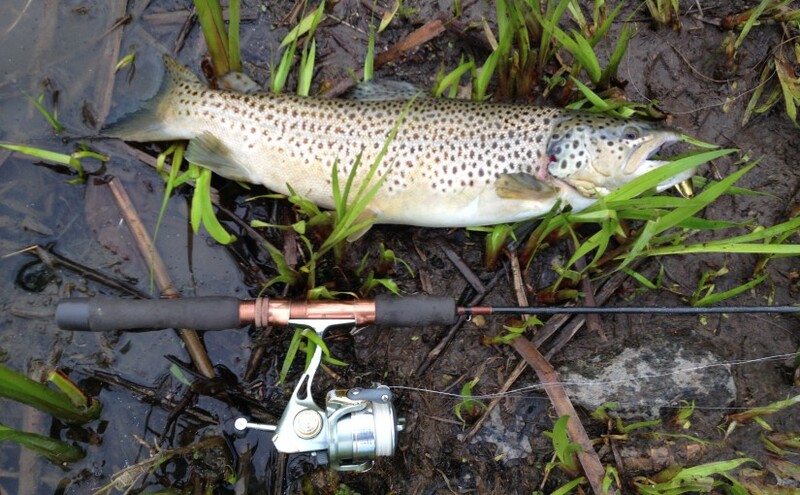 Make a mental note of when and where the trout take the spoon and try to maximize the spoon’s time in that part of the retrieve. Maybe they are mostly hitting on the drop, so you add more drops. Maybe they are deep and far and you only need that first drop to connect with fish. Experiment with retrieves. Experiment with color too. On this day, the classic 5-O-Diamnonds was irresistible. One last important tip: watch your line like a hawk. 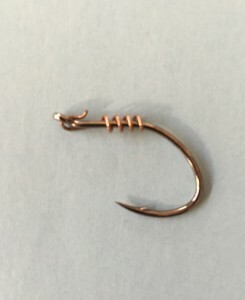 If you see any movement of the line on your drops, take up the slack and be ready to set the hook. Often the bite is visual. You may never feel them take. 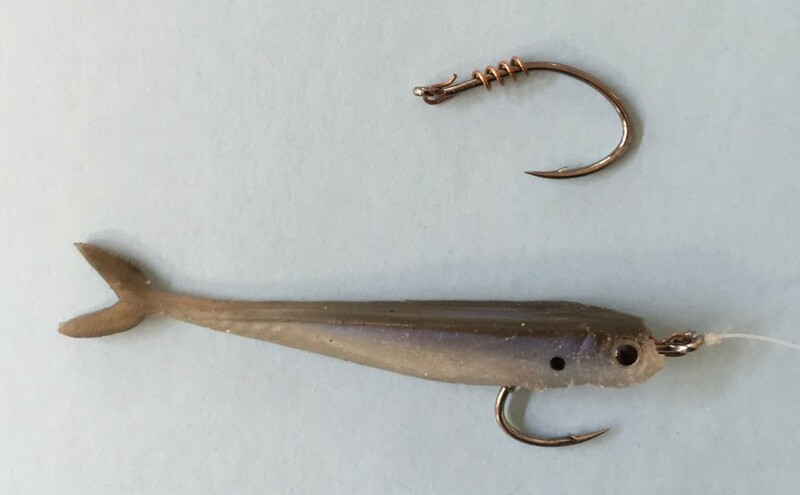 Put this retrieve and some spoons in your arsenal for trout or any gamefish in steep sided waters. It will payoff when other presentations do not. 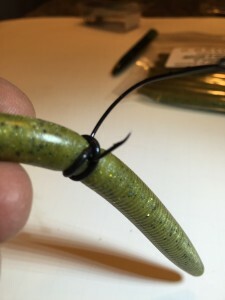 A loop knot is a very useful connection for baits with subtle actions. Jigs, soft jerkbaits, and ultralight crankbaits are excellent examples of where a loop knot will aid your presentation. 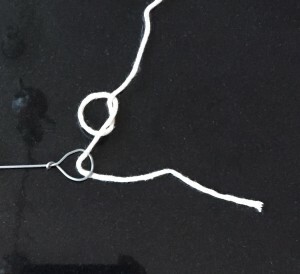 The thicker the line, the more valuable a loop knot connection becomes. 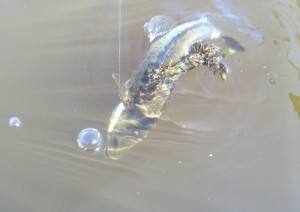 The image above shows a Hawg Shad rigged with a 30# fluorocarbon bite leader attached with Don’s Knot. 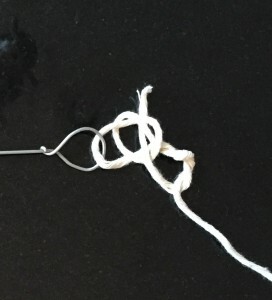 This is an easy and strong loop knot that I use almost exclusively for my loop knot needs. It’s so reliable that I often find myself tying it when a loop is not even necessary for the presentation. A gentleman named Don showed me this knot several years back. If I remembered his full name, I’d properly credit him. I don’t, so I’ll just pass this along as Don’s Knot – which is what I have come to call it. 1. Tie an overhand knot a few inches up the line. Do not pull it tight. 2. Thread the line through the hook eye. 3. 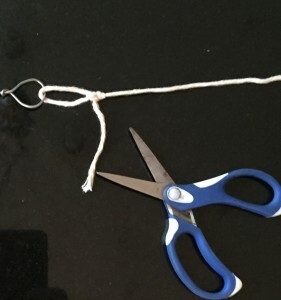 Wrap the tag end around the main line three times above the overhand knot. 4. 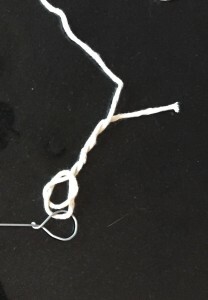 Run the tag end through space near the hook eye and also through the overhand knot. 5. Moisten the knot and pull tight. Trim the tag end closely. 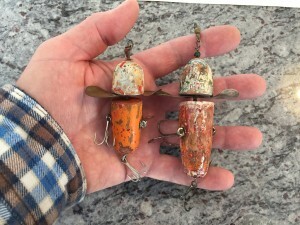 Over the years, I have noticed the majority of the crappies I’ve caught exceeding two pounds have fallen for just a handful of lures. In no particular order, these are my top producers of large crappies. They are not lures that will fill a cooler every day, but they are lures that will fill your memories with images of monster crappies. 1. 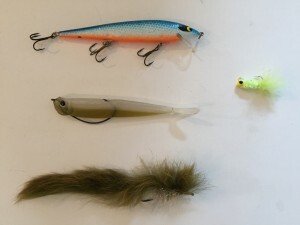 Thin minnow plugs – Rapalas, Rogues, Rebels, etc. 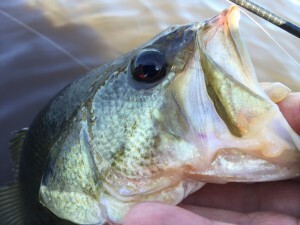 We are talking bass size now – not the size that you would usually consider panfish bait. Select models in the 4 1/2 to 5 inch range. Vary your retrieves. Sometimes slow and steady is all it takes. Other times a twitching retrieve gets more strikes. This kind of bait can also be trolled with great success. Not a monster, but a nice fish, and just average size for the Rogue. 2. 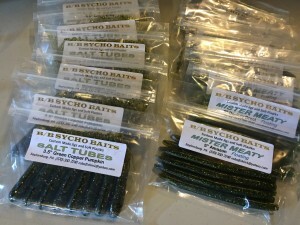 Soft jerkbaits – Hawg Shads, Bass Assassins, even stick worms can fit in this category. Texas rig them without weight. Use a slow, stop and go twitch retrieve to appeal to a crappie’s fondness for weak and dying minnows. The dart and glide action of a weightless soft plastic mimics this perfectly. 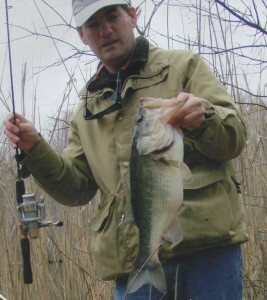 And again, we are talking about bass size baits around the 5 inch mark. 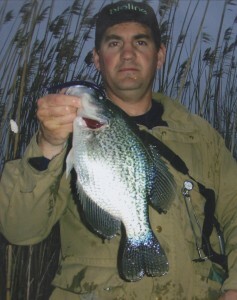 Using “bass” plastics like Hawg Shads while fishing prime crappie waters can yield great benefits. 4. 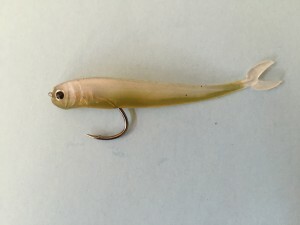 Bunny Leech pike fly – This is the one that started the wheels turning. Many years ago while pursuing pike and bass with the long rod, quality crappies started appearing among my catches. The undulating rabbit strip, and stop and go action are irresistable to big crappies. Now, I’m not suggesting you take up flyfishing just to use this lure/fly. 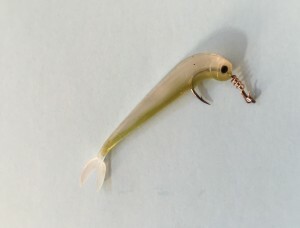 I am suggesting that if you are already a flyrodder, try a 5 to 6 inch rabbit strip leech on your favorite crappie lake. You will be pleased with the results. 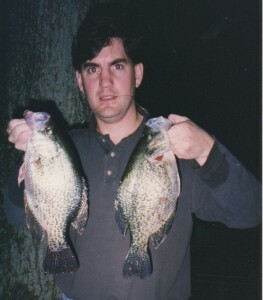 This throwback pic shows pair of 2 1/2# black crappies. These were the first “big” crappies I’d ever caught. Their downfall? 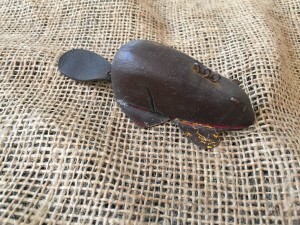 A 6″ rabbit strip fly cast for pike. 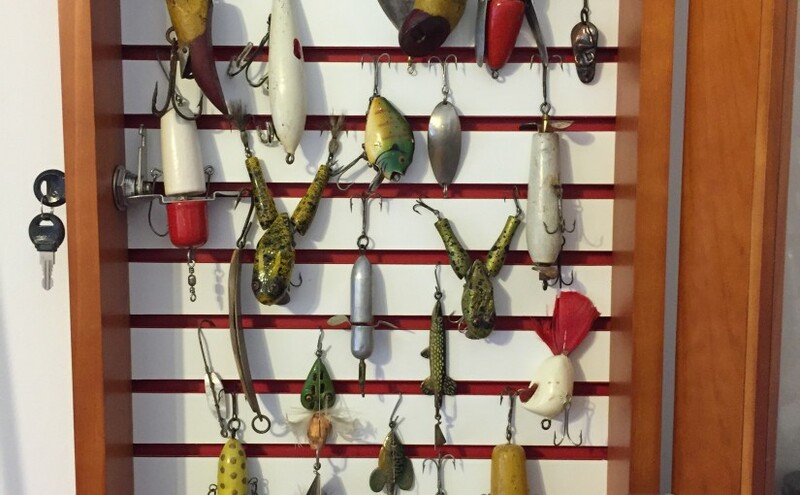 What do all of these lures have in common? Size and shape is the most obvious. 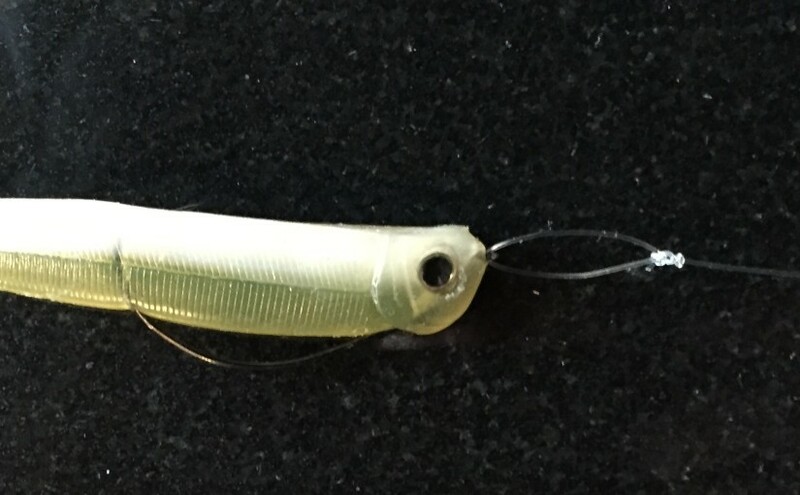 Consider lures with a 4 1/2 to 5 1/2 inch length along with a narrow profile. 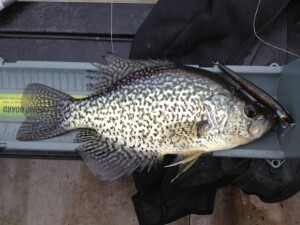 Although they dwarf typical crappie lures, we are not looking for typical crappies. We are targeting the biggest in the lake. The BIG three and a marabou crappie jig shown for scale. 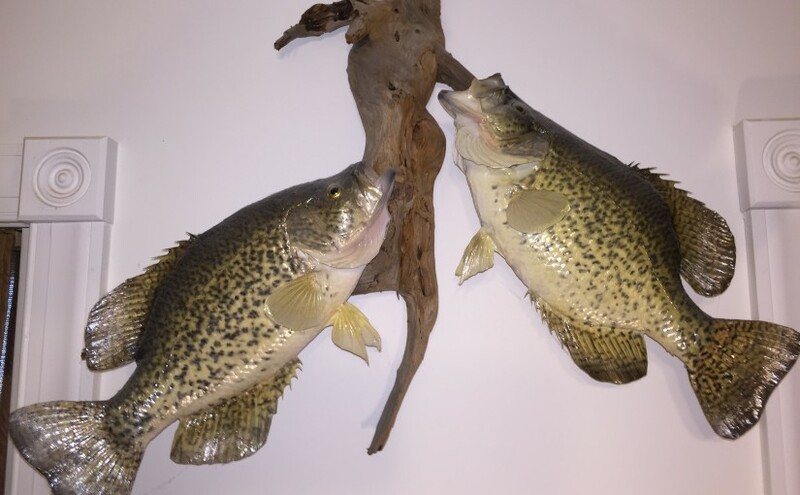 Plenty of bass will also fall for the presentation, but they don’t have to know you are crappie fishing. 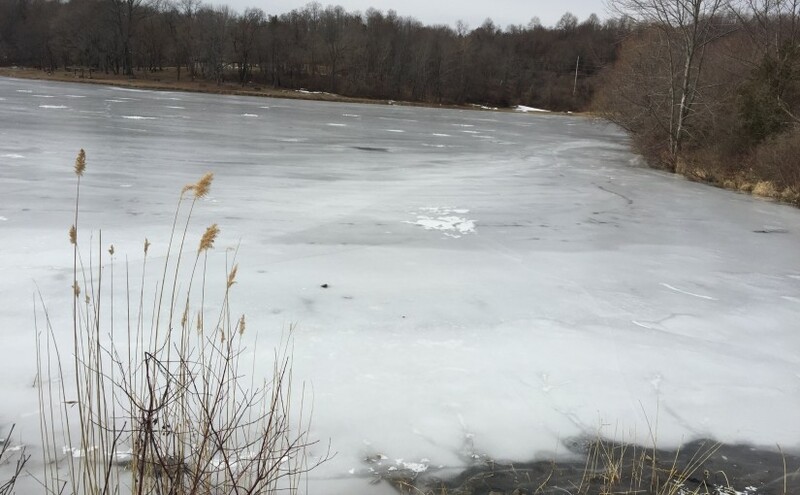 Is your favorite lake still frozen? You can either go stare at your ice hole, or find some open water. I’ll take the latter. Tip 1: Be mobile. Sometimes a small change in elevation or latitude is all it takes to go from ice to open water. For the past couple of weeks I’ve done just that – driven south and then fished the warmest water I could find within those areas. A couple hours in the car and a few degrees is sometimes all it takes fend off cabin fever. Tip 2: Pick a water that warms first. I know I alluded to that in Tip 1, but it is worth stating twice. The first waters to lose their ice will offer the first opportunities for openwater success. From there, find a pattern that you can repeat on other waters as they thaw and warm. Note the trailing vegetation. 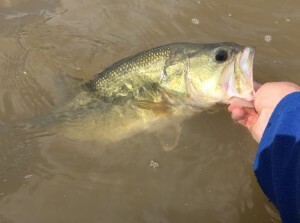 Working lures over a shallow weedbed resulted in numerous February largemouth. 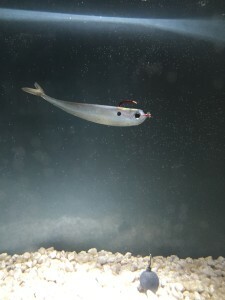 Tip 3: Be willing to use a combination of live bait and artificials. Some days your artificials will outfish the livies, and sometimes it’s the opposite. When possible, use them simultaneously on two different rods to cover more water and recognize a pattern. 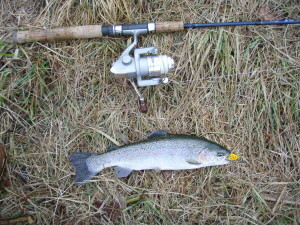 The addition of livebait rod into the spread created the opportunity for this “mixed-species, solo double” with a shiner and a jerbait. Tip 4: Be flexible on your target species. 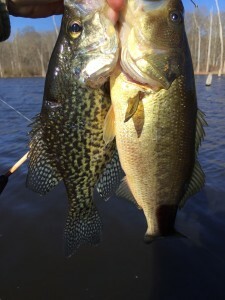 Choose waters with multiple species of gamefish or large panfish. 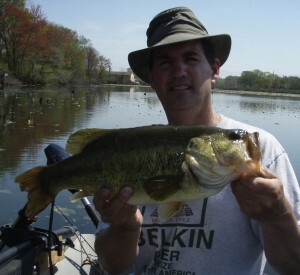 Bass and crappies, bass and perch, bass and pike are all great early season combos. 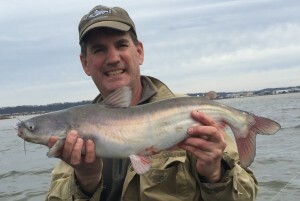 Not part of a typical combo, but the presence of blue catfish added this bonus on a bass lure. Want to catch more fish, and reduce your impact on the environment, and save money at the same time? Use o-rings when you wacky rig. Each of your stickbaits will last longer. 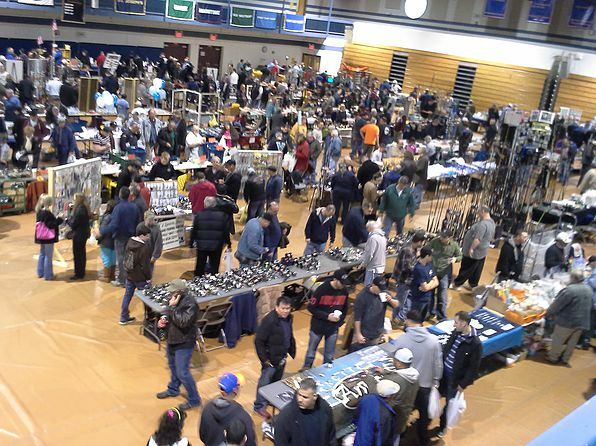 This directly helps your tackle budget. 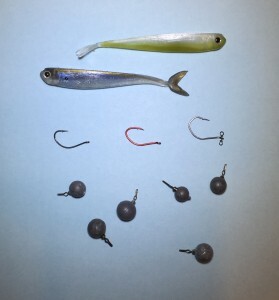 With each bait lasting longer, you’ll also spend more time fishing and less rigging. Baits rarely come off the hook on a strike or a head shaking jump, therefore, fewer baits are accidentally introduced into the environment. It’s cheaper, more efficient, and greener. If you’re not doing it already, it’s worth a look. Here’s a step by step intro to o-rings and wacky rigging. 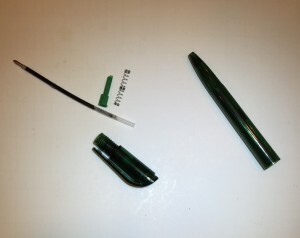 Take apart a dried out ballpoint pen or Sharpie. Keep the large, tapered tube. Discard the rest. 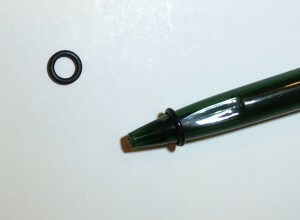 Slide an o-ring on the skinny end of the pen tube. Insert your stickbait inside the pen tube. 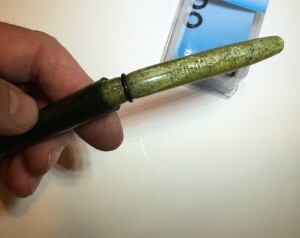 Slide or roll the o-ring up the pen tube and onto the stickbait. 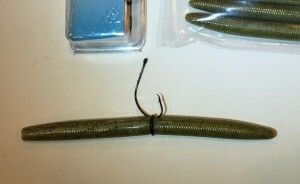 Fold the stickbait in half and move the o-ring to the center point. 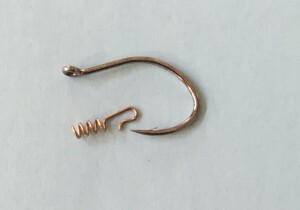 Slip your hook point under the o-ring. There is no need to hook into the bait. 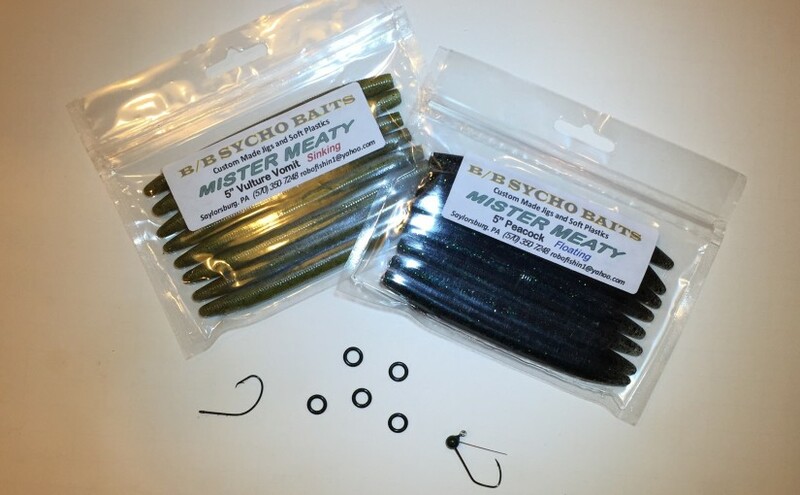 In fact, your baits will last longer if you do not. 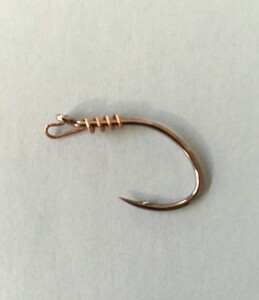 If you prefer your hook to be perpendicular to the bait, use two o-rings overlapping to form an “X”. Slip the hook under both o-rings where they intersect. Spearing fish through the ice is not a common practice in most of the US. In fact, in many places it would be illegal and/or impossible to try. For those unfamiliar with the process, here are the basics. The sport takes place inside an ice shanty or darkhouse. The darkness affords a clear view beneath the ice. A large hole is cut in the ice – much larger than a little, round tip-up hole. The decoy is a hookless lure suspended through the hole to attract predatory fish within range of a spear. Although I’ve never done it myself, I’d imagine the decoy also helps gage distance and size of the fish. When suitable quarry, usually a large pike, comes within range, it is harvested with the thrust of a spear. 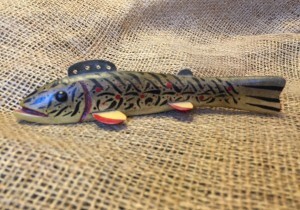 Michigan carver Mike Maxon made this stylized brown trout. The spearing process is interesting, but that’s only half of the story. The other half is the artistry and craftsmanship. 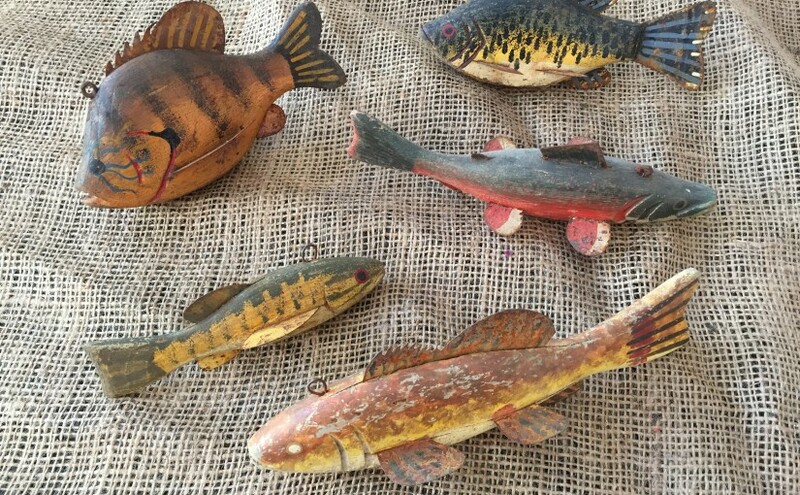 Handcarved from wood and heavily weighted with lead, each “fish” is carefully crafted for the correct balance and appearance to attract predators beneath the ice. Some are made by fishermen who carve, some by artists who fish, and some come from craftsmen inbetween. No matter the origin, each is an expression of creativity and ingenuity. 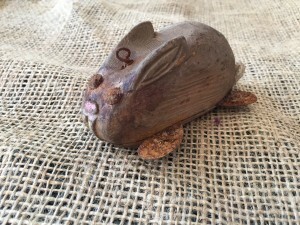 What could be more creative than a baby beaver? Decoys made by noted carvers may fetch hundreds or even thousands of dollars from collectors, but that is not the best measurement of value. The true value lies where form and function are partners, and is measured on a sliding scale of satisfaction rather than dollars and cents. That satisfaction can be reaped by the the fisherman, the collector, or the carver himself. 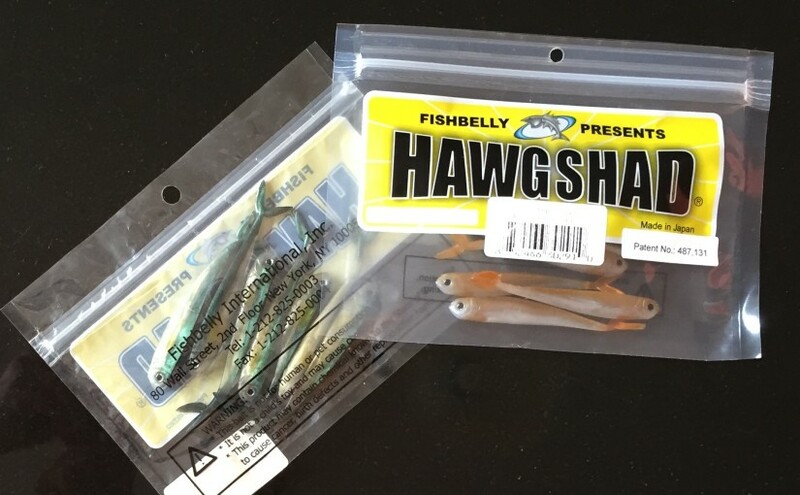 Fishbelly Hawg Shads in 3.5 or 2.8 inch sizes are about as good as it gets when it comes to minnow imitating drop shot baits. The right size, great action, and unbeatable colors set them apart from the competition. A size 2 Gamikatsu Drop Shot hook is my “go to” hook for drop shot rigs. I’ve used other hooks with great success as well, but consider the “Gami” the best of the bunch. Size 2 Hooks from left to right: Gamikatsu Split Shot/Drop Shot, VMC 7356 Sure Set, VMC 7119 Spin Shot. Keeping your movements short and subtle will entice more strikes than a exaggerated jigging motion. Jiggling the rod tip a few inches on a semi tight line works best. Try to use the weight as an anchor and just shake the line and lure for the most natural movement. Subtle movements and delicate presentations make drop shotting perfect for shallow water sight fishing. No need to haul back hard on a drop shot strike. Just reel down tight and sweep the rod firmly and steadily until you’ve got a good bend in the rod. 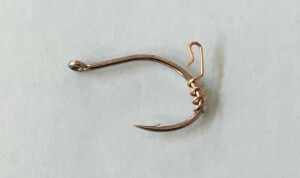 The sharp exposed point of a little drop shot hook plants easily and stays planted. The ease of hook set makes the drop shot system adaptable to many types of tackle, including ultra-light spinning. 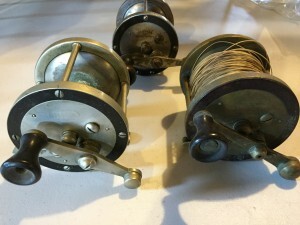 At one time my passion for collecting antique fishing tackle rivaled my passion for fishing itself. Times change; interests change, often in a circular path. My once prized collection is now better described as wall ornaments and a box in the basement. Time to find new homes for some and repurpose others. Finding new homes – a couple Deckers on their way to another collector. Originally from Lake Hopatcong, Decker later moved his office to Brooklyn. 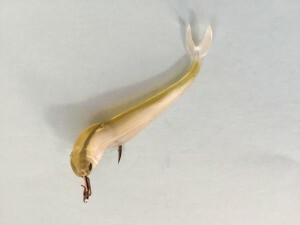 White seems to be the most common color for Decker lures. A bland yet reliable choice. Repurposing – these rough condition, rotary head topwaters will move from the bottom of the collector hierarchy to the top of the experimentation hierarchy in 2016. Before returning to active duty, these oldies will likely receive a repaint.